Field number SB303 (Collector Steven Brack) San Juan County, New Mexico, USA. Blooming habit. Rebutialand cactus collection Demjén, Hungary. Altitude: It grows at elevations between 1480 to 1660 metres above sea level. Habitat and Ecology: Semi-desert. Shrublands, sandy openings. This globose species is most frequently found growing on the tops of exposed hills and mesas in full sun or benches and slopes of hills, from gravelly to loamy and pulverulent clay soil. 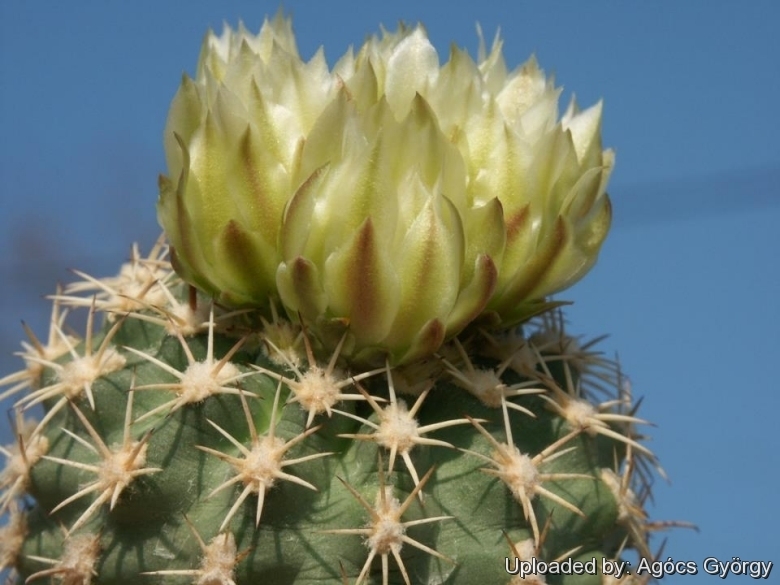 The main past threats were predation by the cactus borer beetle Moneilema semipunctatum and droughts, however, the population recovered after those events. Illegal collection, energy development, potential oil and gas drilling, pipeline construction, mining, and off-road vehicles also pose threats to the species. 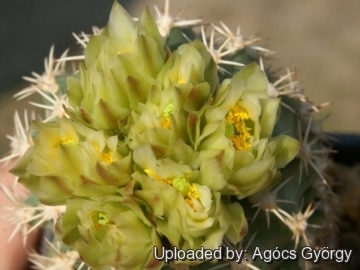 Description: Sclerocactus mesae-verde is a rare and minute, globose grey-green cactus. It is very difficult to locate because it blends in with its surroundings, but when it is found it usually occurs in groupings of several dozens. Flowers range from creamy pink to creamy yellow. 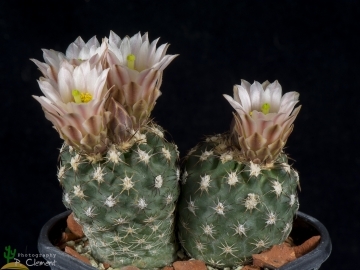 Sclerocactus mesae-verde was formerly classified in the monotypic genus Coloradoa. 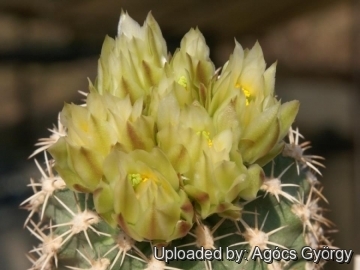 Habit: It is a globular and single stemmed cactus species, but sometimes form clusters up to 15 heads. Stems: Very small, pale green, depressed globose, with a maximum size of only (3-)5-7(-11) cm in height, 4 to 10 cm in diameter. Central spine: 0-1, grey, dark tipped, sometimes hooked, 7-15 mm long. Radial spines: 7-13, yellowish, spreading, 6-13 mm long. Flowers : White to cream-yellow, with light green throats, 1-3,5 cm long, 1-3 cm in diameter and do not open completely. Fruits: Fruits are green, spherical to short cylindrical, 8-10 mm long green, becoming brown with age, indehiscent or splitting horizontally at maturity. 1) Butterworth, C. & Porter, J.M. 2013. 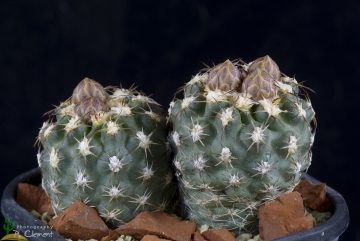 Sclerocactus mesae-verdae. In: IUCN 2013. "IUCN Red List of Threatened Species." Version 2013.2. <www.iucnredlist.org>. Downloaded on 05 April 2014. 6) Fritz Hochstätter "An den Standorten von Pediocactus und Sclerocactus" Selbstverlag, 1989. 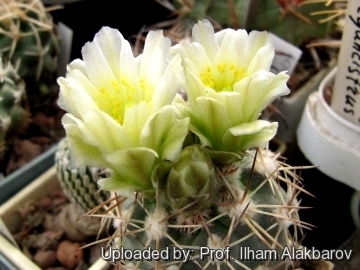 Cultivation and Propagation: This plant is very rare in cultivation, it is difficult to grow on its own roots and to propagate. 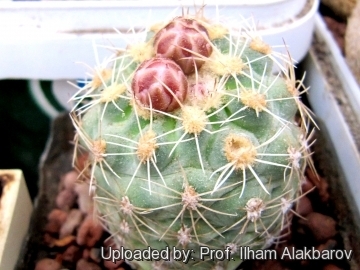 Mature individuals easily rot and die especially after planting. The seeds germinate with extreme difficulty and a low rate of success, seedlings do not do well either, and more die each year. 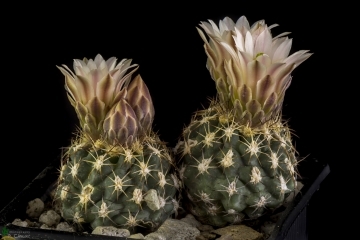 Sclerocactus mesae-verdae is extremely xerophytic and adapted to very dry soils, but plants grafted on hardy stock (Opuntia humifusa, Echinocereus triglochidiatus etc...) are relatively easy to grow and no special skill is required, they can stay in a non heated green house. (min tem -20°C) ... 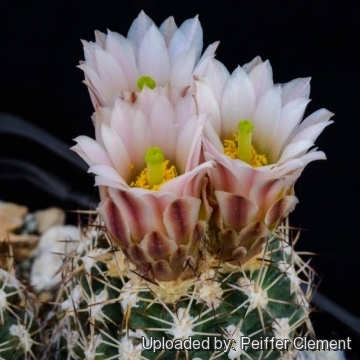 This interesting cactus, continues to be a particular prize among specialist collectors.